CFPA's REAL School Food Initiative brings stakeholders together to identify and work on strategies and policy opportunities in support of freshly prepared meals made from whole and minimally processed ingredients and to improve the appeal of school meals. The REAL School Food Web site also has links to a variety of resources to help schools improve the quality and appeal of school food by increasing the amount of freshly prepared food, by engaging students, by training staff in customer service and by marketing the nutrition programs to the school community. CFPA's BreakfastFirst Campaign helps California's students reach their full potential and California's schools maximize available federal resources by strengthening school breakfast programs. The BreakfastFirst Web site has all the resources and materials schools need to implement and market innovative breakfast service models like Classroom Breakfast and Second Chance Breakfast. 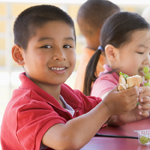 CFPA also publishes an analysis of school meal data obtained from the California Department of Education. These data can be helpful to districts to explain the potential impact of increased participation on the number of low-income students and increased revenue.